The Best Wheel-Cleaning Brushes Money Can Buy. 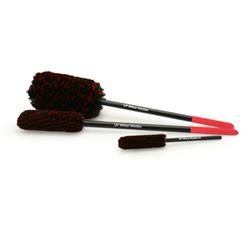 A luxury set of premium wheel and trim brushes custom designed and developed for car care enthusiasts detailers & valeters. Three different sizes of brush head allow safe and effective front to back cleaning of even the most complex of wheel designs. The red foam grip allows for better control as well as providing increased comfort for the user. Large Wheel Woolie (overall length of 18" with a 3" super-soft wool head) - ideal for reaching deep into wheels or cleaning wheel wells. Medium Wheel Woolie (overall length of 18" with a 2" super-soft wool head) - ideal for smaller gaps, air diffusers, door jams and engine bays. Small Wheel Woolie (overall length of 8" with a 1" super-soft wool head) - ideal for tighter gaps and narrow spoke wheels.